I’m always on the lookout for a world class hamburger as the form exists, perhaps a notch below my all time favorite food group; barbecue, Texas barbecue to be specific. My first clue of what I was in store for should have been when it took a half hour to get the burger. In a restaurant that that did not have a single other patron. The tiny patty had been rode hard and put up dry. It was served on a cold, lifeless bun that was eligible for either AARP or the dust bin. It’s rare that I use the adjective disgusting but in this instance it’s more than appropriate. Like your service with a sneer? Barron’s Hamburger Haven offers this timeless feature. Why bother breaking down how all the crucial elements of good burger construction were missing from my meal? It would not have accomplished anything. And then in a stunning rejoinder that will go down in my personal annals of eating, I’m interviewed by a police officer in the parking lot of nearby Thorndale Meat Market [ a very credible source for delicious barbecue ]…..for taking a photo….of the restaurant where I’d just dined! So let this post serve as a warning to travelers who might find themselves tempted to dine at Barron’s Hamburger Haven. There you will find a unique combination of poor quality food and service unlike any I’ve encountered in my decade plus of food journalism. This entry was posted in Rural Texas, Texas Daily Photo and tagged Restaurant, rural Texas, texas, Texas Daily Photo. Bookmark the permalink. please dont judge t dale by the way your treated at barrons. the food stinks, service is bad, and honestly i have only heard this from friends. i wont eat there just from those reviews. 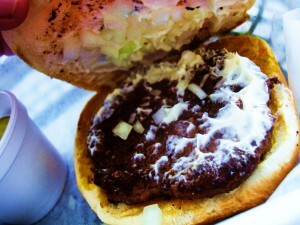 if you want a good burger stop by shreoders place.